Among the very first converts to the Charlie Christian style was Mary Osborne (1921-1992). Osborne was, judging from the very little of her work that exists on CD, a very, very strong player. She swung hard with a robust style, somewhat akin to the style of another early convert to the CC style, Tiny Grimes, but perhaps with a more boppish orientation. Osborne played with Coleman Hawkins, Art Tatum, Mary Lou Williams and other luminaries. Add to this that she sang very well (e.g., check her two pieces on Guitar Rarities, Vol. 2). So why is so little of the output of this fine artist available in the CD format (perhaps about 4-5 tracks, including a few great tracks with Coleman Hawkins)? True — she didn’t put out that much, but why isn’t for example A Girl and Her Guitar available? As I mentioned earlier I have bought a Charlie Christian replica pickup. Usually, you would fit these to a Gibson L48 or a L50 (or perhaps an original ES-150). I have seen the CC pickup fitted to L7s, L5s and even to Super 400s. However, only once have I seen it fitted to a non-Gibson (specifically to an Aria). However, here comes my potential sacrilege: I am seriously considering fitting the CC pickup to my Heritage Eagle! While certainly a nice guitar, the Eagle isn’t that super valuable, we are not talking L5 here, so the issue of cutting a hole in an arched top isn’t that big an issue to me. What I am more worried about is whether the pickup will really fit the Heritage tonally. Peter Broadbent over at the Yahoo group on Charlie Christian once argued that the CC pickup are simply better suited for some archtops than for others (specifically, he mentioned that it wasn’t suited for the Gibson L7). Here is a great German site (in English though) about German archtops, i.e., info about very interesting archtops, notably Lang and some of the Hoyer and Höfner ones, that may have been competitive with the best US archtops of the time, as well as less interesting ones (many of the Framus guitar and most of the Commie Musima ones). Check out the cool pics with one guitar more crazy than next. Zebra stripes, toilet-seat MOP, chrome pickguards, strange soundholes, etc. (check this — is this where Jimmy D’Aquisto got the idea for the Solo’s soundholes?). I can only tip my hat in awe to any company confused enough to build its guitars with beautiful flamed maple laminates, attach its guitar pickguards with common finishing nails, and load its istruments with enough carefully inlaid mother of toilet-seat to furnish the lobby of a Miami Beach hotel. Frequent users of Amazon.com will know of the “listmania” feature. This is Amazon users flagging their book and music preferences. And, yes, there are (at least) five very nice such lists on jazz guitar. My own list — which I will post later — overlaps quite a lot with this one. UPDATE: Here is a nice list on Essential Early Jazz Guitar. Yesterday I blogged on those old Harmonies and Kays (and Silvertones, Sherwoods, Regals, Armstrongs, etc. etc.) and why they aren’t (if indeed they aren’t) used more by professionals. Well, perhaps it is both a quality and an aesthetic issue — i.e., these guitars are frankly often both crappy and ugly. BUT … check out Fat Dawg’s Subway Guitars. It is pretty amazing what the Fat Dawg can do to these old archtops. That Harmony L4-C is just beautiful! And what about the Sherwood? Incredible what a good polish, a quality pick-up, new tailpiece and tuners, etc. 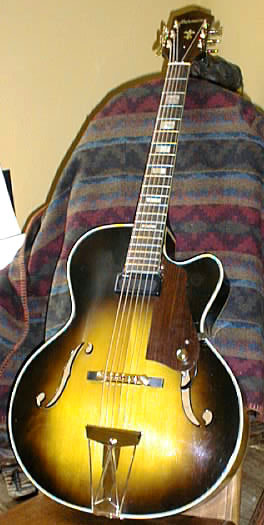 can do to an old time, cheapo archtop. Does anyone know where the clip is from? UPDATE: Here is a fun clip with George playing with Earl Klugh and Chet Atkins. Do you, dear readers, know of any contemporary serious players (in jazz) who regularly use old Harmony, Kay, etc. archtops, in other words, the mass-distributed inexpensive archtops of the 1940s to 1960s, for their professional gigging? Here is info on Kay guitars. And here is a Harmony page. Here is one more. Check this out (and note the beautiful blond ES-175). Here is a very enlightening forum discussion about DeArmond pickups. It is was somehow comforting to read that the FHC pickup may have a tendency to be unbalanced; this is unfortunately the main problem with the one I got (although I love its sound). Here is the Wikipedia entry on Harry DeArmond. I have never seen so many DeArmond archtop pickups offered for sale at the same time. As I write this, there are 3 Model 1000 pickups, 2 model FHC ones , and 2 Model 1100. Drool, drool.